MILLIGAN COLLEGE — Several local college students received an early Christmas present Friday evening — their degrees. Milligan College held its 128th commencement ceremony at 7 p.m. in Seeger Memorial Chapel. 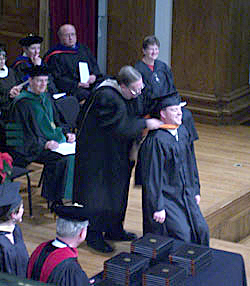 Milligan’s December graduates included four bachelor of arts, 25 bachelor of science, 12 master of business administration, 30 master of education, and 22 master of science in occupational therapy students. Of those 93 graduates, 66 are from Tennessee. Sixteen graduated with honors. Atlanta Christian College Interim President Dean C. Collins was the ceremony’s keynote speaker. Collins told the students that there were only a few times in one’s life that they and their family were able to join together and celebrate the fruits of a long-term labor. Graduation, he said, was one of those times. Collins’ message to the graduates was that even though their graduating class was small and though they graduated from a relatively small college in a small community, God does great things through smallness. “As I remember my roots and heritage…I begin to ponder the smallness that I came from…and it struck me that God often does special things from smallness,” Collins said. He told the story of a small, young boy who comforted his classmates during the devastation of a tragic earthquake. He also reminded the graduates of the story of Jesus feeding the multitudes with just one person’s meal. He also reminded the students that it was a rather small group that started Milligan College more than 100 years ago. In his closing remarks to the graduates, Collins told them to be confident in the smallness that they came from and the great things that that smallness is capable of. Collins has served as interim president at ACC since 2006. He completed his undergraduate degree at Atlanta Christian College and a master of education degree in counselor education from Auburn University. While at Auburn, Collins established the Auburn Christian Fellowship, a nondenominational campus ministry that still thrives. Also as part of the commencement ceremony, the college honored Dr. Charles Allen, Johnson City, with the distinguished Fide et Amore award in recognition of his faith, love and service to the college. Allen has served on the Board of Trustees at Milligan for more than 25 years. Posted by tommy on December 13, 2008.